There are now over 200 million blogs on Tumblr, posting 80 million posts per day (source: Tumblr). So, what is it? Tumblr is a micro-blogging platform, that allows users to post content to their unique Tumblr site, in order to engage and inform. It is like a cut-down version of your website – or a Twitter account with the benefit of much longer posts. Content can be plain text, photos, other images, quotes, hypertext links, music and video. In fact, the range of content that can be posted to your Tumblr site is so wide, it could be considered as a replacement for a Facebook page or even a website. 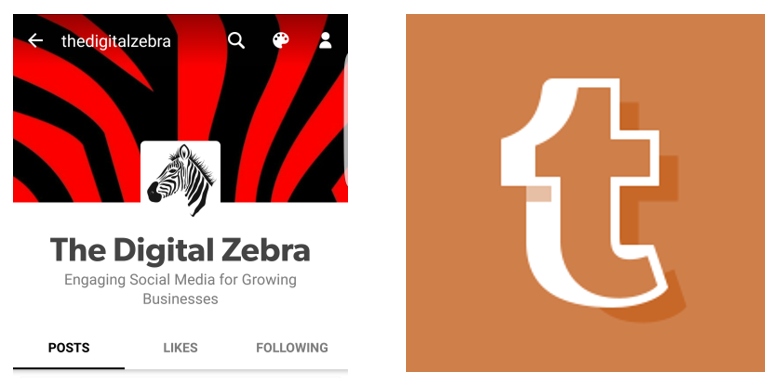 You can subscribe to other people’s blogs on Tumblr – and they can subscribe to yours. By doing so, you will receive notifications as soon as that blog is updated. And your subscribers will immediately be notified when you update your blog. You can post by pointing your browser to the Tumblr website; using the Tumblr mobile apps for iPhone, iPad or Android; using the Tumblr Bookmarklet on a website, which opens up a form in a new window; or simply by email. Posts can be published immediately or saved as a draft for later editing or publishing. Like Twitter, you can make use of other users’ @names to inform them you have mentioned them in a post. You can use images from websites, by pasting the URL directly into the post form. Support for Apple TV – you can play any – or all – of Tumblr’s 100 million GIFs via the Tumblr TV app available on the App Store. Bump to Share – this feature for Android phones with NFC turned on allows you to touch your screen to someone else’s so that your blog will open on their screen. Tumblr in Google results – when the Tumblr logo appears next to a Google search result, the link will open in the Tumblr app. Tumblr offers businesses the opportunity to Sponsor Posts, targeted by gender, location and interest and can be syndicated to Yahoo! “for added reach”. Tumblr also offers Sponsored Video Posts, enabling businesses with analytics on views, looping and engagement. And a third opportunity for businesses is presented with Tumblr’s ability to offer a Sponsored Day. This is where businesses can have their logo and tagline pinned to the Tumblr “dashboard” for 24 hours. Tumblr is based in New York, with offices in Richmond, Va. and Los Angeles, Ca. Founded in 2007, Tumblr now employs more than 370 staff. Why not use the power of Tumblr to help promote your business? We can set up your blog for you, update it regularly and help you benefit from the huge growth of use of Tumblr. Email us now – info@thedigitalzebra.com.